Duckhorn Vineyards has produced Cabernet Sauvignon since 1978. 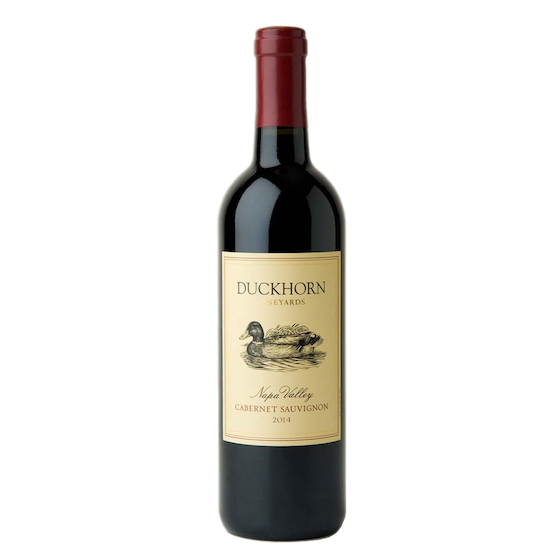 This particular wine, which combines fruit from Duckhorn’s estate vineyards and top independent growers, embodies the complexity of Napa Valley. In the 2015, you’ll find a seamless balance between fruit, oak, and tannins. A warm, dry spring resulted in an early budbreak, while an extended flowering period brought a return to normal yields after three years of abundant crops. This resulted in the quality of the fruit being exceptional, with the red grapes displaying a fine balance between elegance and intensity, with gorgeous dark fruit flavours. Following fermentation, lots spent 16 months in French oak, equal parts new and used. The final blend is 82% Cabernet Sauvignon, 10% Merlot, 6% Petit Verdot, and 2% Cabernet Franc. This is a complex, compelling, generous wine that reflects the diversity of great Napa Valley Cabernet Sauvignon. On the nose, bright layers of red and black fruit are balanced by boysenberry, cherry, strawberry, cedar, and sage. Flavours echo aromas: On the palate, fig, licorice, and cinnamon elements are supported by firm, impeccably balanced tannins. Good acidity carries the juicy dark fruit notes through a long, satisfying finish. You’ll be pleased to know that this wine is both approachable in its youth and worthy of cellaring.